Kind of like turning a zombie into a zombie game, the anime music-infatuated blogger types are doing a tournament, where various vocal themes, openings and endings battle each other in a popularity contest, only to be separated by strangely nerdy seeding patterns. Well, the whole endeavor is pretty nerdy so whatever goes, I guess. Did I submit something? Sure did. You have 15 slots, which is pretty good given how I usually have a top 10+ going on, although at this time and this date and this age, the biases will show. Especially the stuff in my car. And I’ll share some of that…later. What I want to talk about is the role of the meta in music appreciation. I think it boils down to that cultural and artistic expressions have contexts, and listing to anison is really just a form of appreciation of some kinds of expressions within a specific context. No matter if you think of anison as some simple commercialism or museum-quality superflat-astic display pieces, it doesn’t really change the way how context matters probably more than the musical pieces themselves. Just earlier today [as of this writing] someone said to us that dance makes Love Live songs better. I’m inclined to agree; part of that mix-media franchise’s appeal from the start had to do with the full-motion MVs that came with their first few singles. The song and dance routine appeals a lot better than the songs themselves. And this is kind of the fundamental truths about anime music. It’s all just tie-ins, aren’t they? And a lot of the fun in listening to it is associated with the thing the music is tied to. Or FUN if you speak with weird articles. 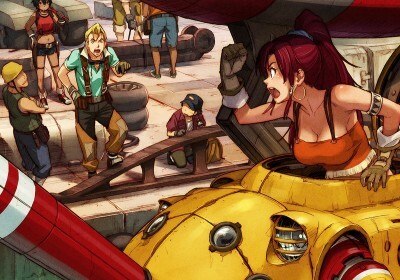 It’s like when I hear TANK, I don’t think of a great SF mash-up anime from the late 90s. I think of an over-played, over-used AMV track that sounds about 100 times better live than studio. And What Planet Is This is better. So it’s kind of simple, if you think about the tourny this way. Basically whichever context has more subscribers, the songs within that context will speak to more people in that way. It’s somewhat different than simply the most popular songs from the most watched shows, because just because an expression is well-understood, that doesn’t mean the expression will resonate well, or is meaningful or appreciated. Just like my previous example, what that song speaks about may vary from person to person, even if it’s a well-understood saying. Just like “Libra me” might be about reason kicking and curbs, but it might also mean the ultimate phallus of masculine expression to someone else. What can you do about it? Tighten up the context. For example, see these. And for better or worse, yes, sometimes, that means the girls must dance. To me that’s great, because, well, here’s one of my submissions. 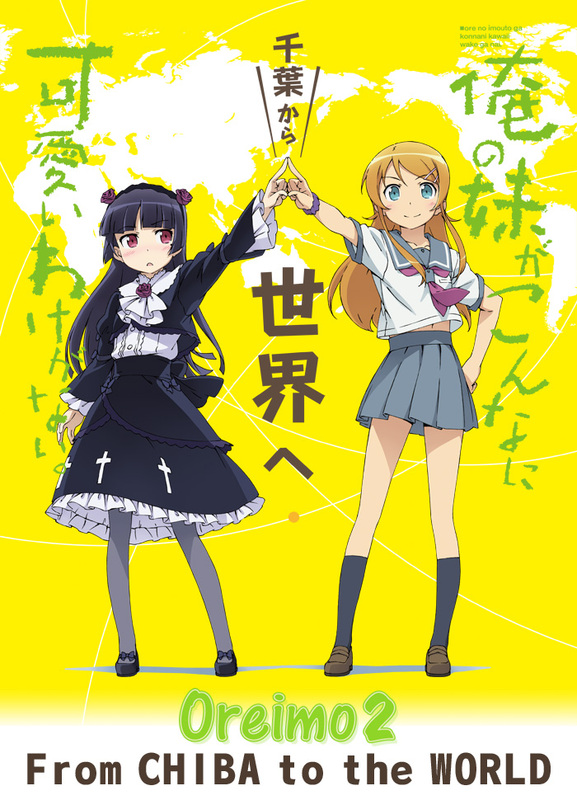 Every staff and cast member who has been involved in this series has put their hearts and souls into these last 3 episodes of “Oreimo 2,” and we have all been hoping to share these final episodes with as many fans as possible. When we saw so many dedicated fan submissions to the “Oreimo 2 Web Radio Show” from our international fans who watch every week through various streaming services, we knew we had to provide an environment where every fan can watch and experience these final episodes simultaneously. And yeah, it was written bilingually in English and Japanese. Oh, of course, the bigger news is that OreImo OAV streaming for everyone without the time lag. I don’t know, does this obvious acknowledgment of the episodic bubble, the “watch every week” water cooler-style chatter (except it happens mostly online) in which drives this particular niche fandom, mean something after all? 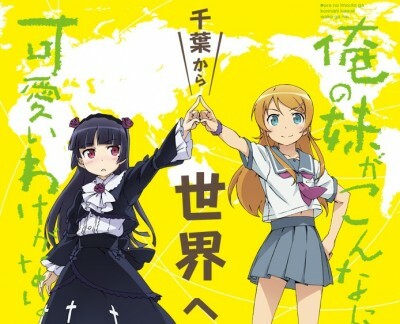 And of course, last Thursday was when the latest OreImo S2 radio came up and the hosts did mention the large volume of English-language submissions. I think during the foreign mail segment, there was a letter from Singapore who pretty much dissed Ayachi outright (but he did apologize). There was definitely some internet-tard-y guy who referenced Hanazawa as “Hanakana-chan.” It’s kind of funny I GUESS? There was some Californian-tiger dude with an unique greeting. There was a letter from a Canadian sisters doing real talk about the difference between fujoshi and otaku-ko. Finally (or initially?) there’s this pretty much incomprehensible letter that makes no sense? Can TKTT pronounce “Commander Riker?” The world will never know. Kind of like this simulcast announcement, I think people realize foreign otaku knows their stuff as much as slick Aniplex-types know about the foreign market. At ~5 hours post-tweet, there are about ~1000 RTs for the ep16-18 tweet announcement in Japanese, and about a quarter that for the English version of the same tweet. Does this mean we’re about 1/5? Should I check back in a day? Is it fair to assume our oversea comrades not in Japan would rather RT in Japanese? Does pointless speculations make any sense? But yeah, throw us a bone, even if it’s full of crap like this, we’ll slurp it up gladly. Regardless, it’s always a good time with Hanazawa and Taketatsu. Hopefully next week they will do more foreign viewer mail! Read more about it here and listen to it here! PS. We should all submit tongue twisters in English or something. You know. …and I survived my first big gaming convention. I have some takeaways to reflect on, for example how the “anime” stuff is like out there in the non-anime con context, and how con culture is different between different groups, and all that stuff. But I liked my first Origins, mainly because I hung out with some old school gamers and they are a good group to hang with. I found this little rage-induced spiel from Astronerdboy’s site appropriate as a typical example of a bad DMCA takedown. People generally gets irked. Even I felt irked. [Tho probably not as irked as when Google Adsense decided that my site violated their age rating policy and still spams me with their promos.] My problem with Asteronerdboy’s takedown rant is that while this is part of the work that Japan has to do in order to resolve some of the problems I’ve been complaining about, namely, srsly guys, let’s do SEO in English please, ANB doesn’t seem to understand how copyright works (eg, every time that green header loads up I kind of roll my eyes), although that is also very common among most people who gets a takedown. Ah well. Where there’s mass DMCA takedowns, there’s chillingeffects.org. Paranda and cowboybibimbap are both in Japan doing their respective wota things. Good time to track what’s going down! Feel chasers gonna chase feels. I’m helping Wah to run a panel at Otakon. It’s about nerd spots in Tokyo. I will have prizes to give away at some point. The panel is called Otaku Hotspots in Tokyo and it might be a veiled advertisement for A-Button and Garten, who knows. Talking about it also makes me want to go see ZUN at AWA. It also makes me miss this brewpub IPA I had last weekend in Columbus. And this other IPA…hybrid that I had in Columbus. Or this coffee-based stout I had in Columbus. Some good stuff there. Otakon also has listed their fan panel winners er I mean panelists. Take a look. Given that Otakon this year will be nuts schedule-wise, I hope I get the first-thing-Friday spot. Let’s see how it works out. Anime Expo’s schedule, in comparison, feels a lot easier to plot. The big things I want to check out are all going to not conflict, not counting autographs. So we’ll see. Going on a limb to interpret the latest episode of Gargantia, I draw from the form of despair and sense of stress that NEETs have to deal with. Since talking about that episode of Gargantia invariably means spoilers, I’ll talk about what I mean by despair and stress first. Well, first, read this post and get on the same page, if you haven’t already. I’m just going to take a shot at the next stage of the NEET stimulus package. The average NEET probably wants a reasonably paying and steady job. I say this because the demand for those jobs are always pretty high; that’s why they are relatively hard to land in today’s economy (Japan and elsewhere). The societal pressure is, as understood by the NEET or freeter, a form of reinforcement of these kinds of cultural norms. And of course if you do have a steady job that brings in good money, staying single means you can go to all the offkais you want, cons, wait in line for goods, whatever. Living the single life, instead of living-with-parents-and-waking-at-odd-hours life. In 2013 terms, it’s no longer clear if becoming a NEET is really socially unacceptable, because people understand the truth that it’s hard to get a salary job as a young person in Japan, even if it’s one of those “success” indicator. The subsequent problem with NEET-ness is well documented in terms of getting that late start in life, being able to plan for retirement, etc. Not sure if that has much of a bearing on Gargantia’s narrative, but it’s worth noting. And the way I see it, it’s all in the head anyway. Much like Ledo’s understanding of his predicament by the end of episode 10, being a NEET/freeter can feel stifling, as if you are cornered with no way out. Getting a job NOT as a fresh grad is harder than getting one as someone who’s just out of college. Companies naturally would wonder why you didn’t get a job the first time around, at least in the NEET’s head that’s what goes on. Settling into a strange pace of life trying to make part-time jobs can make it harder, just like doing anything else while working the graveyard shift or simply having to deal with a normal workday. Worst of all, you can fall into a habit, develop a rhythm living the NEET or freeter life, assuming your situation is stable enough. And the longer you fly in that standby pattern, the harder it is to land a permanent job or break out of that funk. Invariably, unless it’s a planned period of NEET-ness, NEET status tends to continue for a while. Truth is, I think most people, eventually, get back on their feet. And in truth, there’s nothing Gargantia can do to solve the root problems–unemployment, societal expectations, the way employment works in Japan, all that jazz. All it can do is encourage people to feel better about themselves, and show that while they may be victims of the situation, they can do something about it. The con intersected a tropical storm on Friday. Thankfully things cleared up mostly by Saturday morning so the grass, despite still full with moisture, didn’t give into muddy slides. And this is important at AnimeNEXT 2013. Since its relocation to the Doubletree / Garden State Expo Center right before the anime bubble burst, it’s got a lot of grassy gnolls and alcoves for photographs. In fact, down the road from the con, there’s this place called the “Palace” where large halls are rented out for elaborate weddings (and wedding photography) and other events. (Like the NJ State Bar Exam.) In other words, it’s great location for cosplay photography. In exchange, the location is pretty horrible for the usual hall cosplay photography since there really isn’t a large, open and centralized area unlike, say, the water fountain area at the BCC or the main lobby at the LACC. It’s hard to find where everyone is. Even Animazement has the front lobby area, and its glass-y construction means you can see both the indoors and outdoors areas easily, increasing its effective size. At Anext, there is actually a place where cosplayers congregate, which is to one side of the Doubletree, by the so-called red docks. But it’s like, way to the side and you wouldn’t even know where to look unless you knew. The blurb about cosplay is just so you guys know why I was there: take cosplay photos, and write about Sayo Yamamoto and Hiroshi Shimizu. 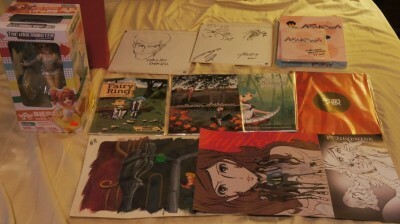 I got Lupin on a shikishi, can’t really ask for more than that…although I could’ve asked for, say, a Michiko instead. Sayo Yamamoto is, well, a bit stereotypical artist-y Asian woman. I think she’s probably just slightly younger than I am. Despite being talented I think she’s still got a lot of ropes to learn in the industry, so to speak. There’s not a lot to say, Shimizu is quiet but articulate when speaking, and Yamamoto is a bit flighty. The interpreters were not too helpful but it was what it was, nothing I haven’t seen before since the conversations can get down to the nitty gritty. The only real takeaway is that Yamamoto is working on a new thing and it should be pretty cool. And somehow she is a fan of Yakushimaru Etsuko, which is to the surprise of no one. The rest of the time at ANext I hung out with @7thwraith and his friends. Lots of words were spoken, jokes cracked, good times. I learned a lot about ANext cosplay culture that I never was interested in but am kind of now. There needs to be more Producers, surely. Since these guys are local to me, this is possibly some exciting news, who knows? This is probably the first time I ate at the con for con food, the whole time. Actually, mostly in the Doubletree because the hotel had at least real food for prices that aren’t outrageous. Because parking is a pain, kind of. One of these days I’ll just go to Mamoun’s on my own, and I can possibly claim having been to all three locations! We ran into some random Makoto-P who was volunteering at the con. It was kind of amusing. Also kind of strange interacting with people who just do it differently. I guess that’s just how it goes. I also ran into most of the rest of the guys I always see at the local East Coast events. Ed’s industry panel was pretty much just unhinged. One margarita was all you need man. I said hi to EJ, who is someone new to this scene, for sure. There was no new announcement at the Aniplex panel, but I guess that’s to be expected. Man, imagine if you’re this Cali guy and work sent you to a con in New Jersey! I have way more sympathy for him than the Texans. Yamamoto and Shimizu’s autograph session gave away these Fujiko Mine anime posters if you wanted something to get signed by. The 4 scribbles? Moon Stream baby! Also, Doujin Press was there. Pretty snazzy.